A new video of our Euroseam product being manufactured and installed has been causing quite a stir. The video shows the production, layout and installation of 140m long sheets on the roof of a new bespoke facility at Alconbury Weald. The sheets were ‘rolled at eaves’, manufactured directly onto the roof for a fast, easy access solution that is probably the only way to get such long sheets onto a roof. 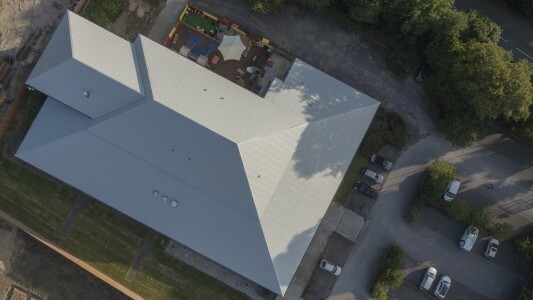 Kingsdown School in Stratton St Margaret, Swindon, has recently given its sports and leisure centre a brand new roofing system using Euroclad’s specialist Elite Refresh system. After acquiring Kingsdown Leisure Centre in 2011, Kingsdown School refurbished the centre to create a state-of-the-art sports facility. The school then made the decision to upgrade the building’s roof when the existing one proved to be nearing the end of its life. Euroclad’s Elite Refresh system was chosen for the job in order to take advantage of the benefits that are inherent in Elite Systems, supplied as a tailored solution for refurbishment. The 12-week project was installed by Mitie Roofing, who refurbished the deteriorating roof to make it fit for purpose once again, installing the 32/1000 Euroclad external profile as part of the Elite Refresh system, manufactured using Colorcoat Prisma prefinished steel in Metallic Silver. Elite Refresh provides a way to increase building longevity, whilst improving thermal and acoustic performance, by over-cladding an existing structure. The recently developed Elite Refresh systems offer many of the benefits available with standard Elite Systems and can be adapted to suit various existing construction types, from fibre cement to composite panel. To meet the unique requirements of each project a combination of top-hat sections, the Quattro spacer system and quilt insulation is used in conjunction with any of the external sheets available in the standard Elite Systems range, depending upon project specifics. The installation took place during the school’s term time, which required the sports centre for lessons. The Mitie installation team were faced with the challenge of keeping the facility fully operational and safe for the pupils whilst installing the Elite Refresh system. As the installation took place over the winter, the installers also had to ensure that rain did not leak into the building and create a hazard for pupils inside. The overall project required part of the roof to be removed and replaced, whilst other parts of the roof could simply be refurbished. Elite Refresh proved to be the ideal solution, offering the performance and flexibility to suit both the over-cladding and strip-and-replace parts of the roof, whilst enabling Mitie to ensure the safety of the work and study environment with minimal interruptions to the daily running of the school. This Autumn sees four new schools open in South Wales as part of a scheme to improve and advance educational facilities to deliver a 21st Century Curriculum. The overall project, headed by Willmott Dixon Construction, includes two newly built schools in the boroughs of Caerphilly and Torfaen, and two redevelopments of existing sites, also located in Torfaen. The construction works have involved many companies supplying their services or products, including Euroclad’s specialist Elite Plus 4 Roofing System and tailored flashings for all four buildings. 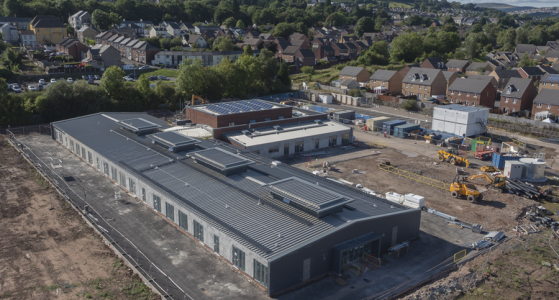 The advanced roofing systems were specified and installed – using a local workforce – by industrial roofing and cladding specialists, ABS Elbrow. Euroclad also supplied bespoke metal flashings which were used to complete thousands of metres of perimeter across the four buildings. Flashings are a crucial addition to Euroclad’s Elite Plus 4 Roofing systems as they close off the building envelope and prevent water or rainfall from penetrating the building joints. This helps to maintain the structure of the building and prevent deterioration or damage from wet weather conditions. The flashings provided to ABS Elbrow for installation were stocked and held ahead of time at Euroclad’s manufacturing base in Cardiff. The material was delivered as a coil and then flattened, folded and cut according to the measurements of each of the school buildings. This allowed for a quick lead time of up to 48 hours from the initial order to delivery, so that the installation and construction work was not delayed. Euroclad’s specialist flashings team works closely with contractors to ensure that an accurate system is produced, with the aim of achieving a flawless finished installation. The flashings are manufactured on state-of-the-art press brakes and folding machines for the highest quality finish. For project specific flashing quotations, get in touch with our dedicated flashing pricing team. Bespoke material utilisation software and vast material stock, combined with dual shift manufacturing and an experienced logistics planning team, allow for accurate quotations and short delivery lead-times across the length and breadth of the UK. 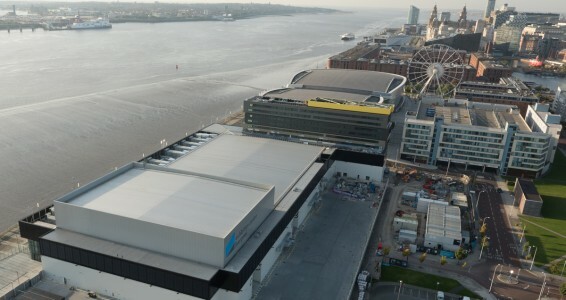 With views across the River Mersey and the city’s UNESCO world heritage site, Exhibition Centre Liverpool is the newest addition to the existing Arena and Convention Centre (ACC) Liverpool, already home to the BT Convention Centre and Echo Arena. With an ElitePLUS 4 acoustic roof system, the recently-built venue has already been earmarked for a range of exhibitions, from medical wound care to cruise holidays and wedding shows. Acoustic and thermal performance were key aspects of the building’s performance so it is not surprising that the overall roof construction provides 45dB sound reduction and thermal transmittance of just 0.15W/m2K. The Euroseam® outer profile used on this system is mechanically fixed by folding the seams on each edge of the sheet over a stainless steel halter, which is attached to the building structure via the Quattro spacer, which is fixed through the liner sheet into purlins attached to the main structure of the building. Euroseam® forms the outer layer of the ElitePLUS roof, combining with insulation, the MW5 Liner and Quattro as the main constituent parts. The MW5 liner profile was supplied in black; not a typical liner colour. Bright white or High Reflective colours are usually employed on the inside of metal roof and wall systems to maximise natural daylight and reduce energy consumption from artificial lighting. But in this case a black finish is understandable, providing an influential element in the control of ambient and spot lighting at such a venue; all but eliminating unwanted reflections during performance and theatre events. It also matches the design of the colour scheme, which runs from outside the building to the interior, with a striking monochrome palette that contributes to the clean, modern aesthetics. To top it all off the Euroseam® profile on the outside of the roof was an ideal substrate for an expanse of photovoltaic (PV) systems. Euroclad partnered with Solar Advanced Systems, who managed the installation of PV panels covering almost the entire roof. The PVs were attached to a pitched framework to provide the optimal angle for solar energy capture. The framework was anchored to the roof using a special Euroclad clamp, which avoids sheet penetrations, whilst providing a secure anchor. 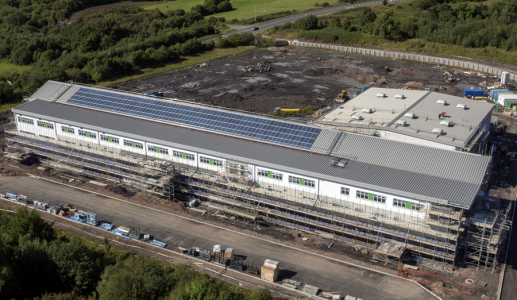 The 250KW PV system formed part of the overall ‘energy from envelope’ ethos, combining with excellent thermal insulation to help minimise the environmental impact of the building. It is estimated that the venue will bring some £40 million to the wider local economy – equal to the amount invested by Liverpool City Council – and support some 1,300 jobs. Having invested in such a significant building, it is important that it endures. It will do so by being flexible enough to suit wide-ranging requirements. This was at the forefront of the minds of architects Denton Corker Marshall when considering the design, which influenced the choice of materials and finishes from the start. With a total useable floor area of 16,300m2, courtesy of fully retractable walls, the 8,100m2 exhibition space has the facility to be divided into three interlinked, column-free, 2,700m2 halls, one of which having an elevated roof of 18m to accommodate full stage shows and exhibitions requiring increased height. With major events already booked even before the venue was finished, The Exhibition Centre, Liverpool has a bright future ahead. 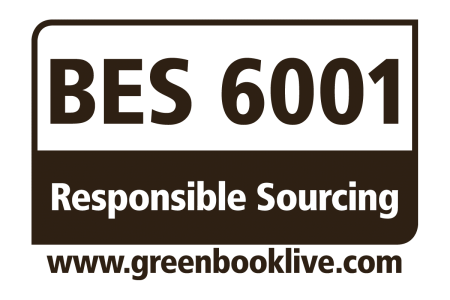 We are delighted to announce that Elite Systems have achieved BES 6001 certification for responsible sourcing. The recent audit of our management systems, conducted by the respected independent authority BSI, resulted in one of the three higher certification levels of the BRE standard being achieved (A ‘Good’ rating). This covers all of our Elite roof and wall assemblies, which provide structural roof and wall solutions with diverse applications, flexible performance and a range of external finishes. With this achievement Elite Systems now provide even greater peace of mind, featuring BES 6001 alongside BBA certification of all systems and CE Marking of all components*. This is further strengthened by pre-existing, accredited management systems for quality, the environment and health and safety. Whilst recent years have seen increased publicity associated with global environmental issues and the impacts of businesses on their communities, we have always recognized that our procurement decisions, manufacturing and supply practices can have an impact beyond our processes and as such, have endeavored to procure energy-efficient products through appropriate ethical behavior. In short, aiming to meet the needs of the present without compromising those of future generations. Certification provides independent assurance of the robustness of our responsible sourcing management systems and compliance to the standard demonstrates that we take the environmental and social impact of sourcing components and materials seriously. BREEAM recognises the increasing importance of the issue of responsible sourcing. A section on responsible sourcing of materials is an integral part of the materials element of the methodology, with points secured from BES 6001 securing additional credits in BREEAM. With the government’s increasing focus on sustainable development, many construction companies are recognising the need to prove that their buildings are built with sustainability in mind. One element of this is in the responsible sourcing of products used in their construction and the onus of proof is increasingly being passed down to the manufacturers of those construction products. The BRE standard BES 6001 describes a framework for the organisational governance, supply chain management and environmental and social aspects that must be addressed in order to ensure the responsible sourcing of construction products. External auditing ensures all associated requirements and practices are appropriately maintained and that we are embedding these key considerations at the core of our activities. We continue to collaborate with key stakeholders, and operate in a manner that is safe and respectful to people, our surrounding communities and the general environment. Vieo has once again proven its suitability for the refurbishment of traditional buildings with its specification for the extension of a 17th century listed house in Thorverton, Exeter. Cherry Tree Cottage has been significantly altered and modernised internally, whilst retaining a plan that identifies with its heritage. 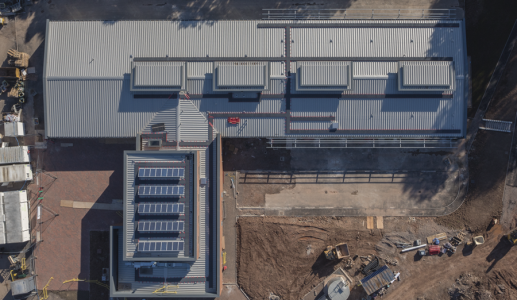 VieoZinc was chosen for the roof of the new extension; a material which provides the perfect combination of traditional zinc looks with the benefits of modern metal roof manufacture. The material is comprised of an aluminium substrate with a coating that contains actual zinc particles; providing the characteristic look, finish and weathering of zinc sheets. 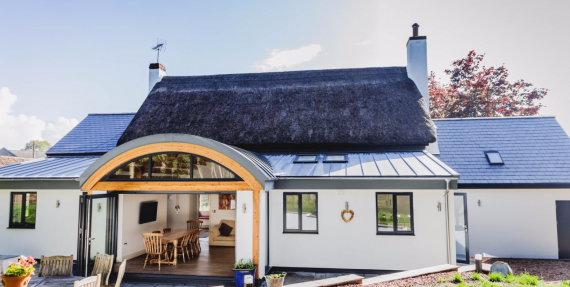 Euroclad installer MPK Cladding installed the Vieo roof for main contractor Raleigh Property, with Devon-based Living Space Architects helping to translate the vision of clients Andrew and Kelly Foster into reality. The extension has been designed to contrast the existing building, which VieoZinc helps to achieve by providing a modern contrast that is at the same time complementary to the traditional exterior. The overall effect is a vibrant, contemporary addition to the property. Tata Steel has launched a unique and revolutionary colour system that easily and quickly navigates specifiers to the right Colorcoat® pre-finished steel product and shade for their metal roofing or wall cladding project. Colorcoat® Compass is the first system of its kind in the European building envelope market – and is available now. Colorcoat® Compass is an innovative, all-encompassing digital system that works alongside a specially developed colour-measuring instrument to return a detailed colour scan. 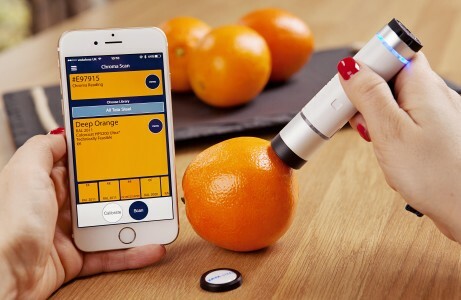 Almost any object can be scanned and the colour matched within seconds. Whether that’s another building material, a client’s corporate colours or maybe even a piece of fruit or your coffee cup for inspiration! For more information on Colorcoat® Compass or to arrange a visit from your local representative to see the new tool in action please contact the Colorcoat Connection® helpline on +44 (0) 1244 892434 or email colorcoat.connection@tatasteel.com. We are delighted to have been selected as finalists in The UK Roofing Awards 2016. With almost 300 entries in the competition two building with Euroclad roofs have been included within the shortlist of 56 projects across 14 disciplines. 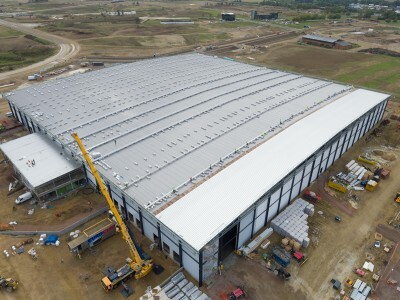 Hitachi Rail Europe is one of the shortlisted projects, installed by Northern Cladding, with Ardley ERF being the other, which was a collaboration with Weatherwise. Winners will be announced at the Awards Ceremony on Friday 13th May at the Hilton London Metropole. MCRMA offer member company employees the chance to keep up to date with the latest requirements of legislation and industry standards with their training course. Matt Purbick, Emmie Panagopoulos,(Both from the Technical Dept) Marc Blackie (External Sales)& Sophie Sheedy (Business Development)were lucky enough to attend the training course during October, which also involved practical exercises where they learnt how to use hand tools to cut and fix modern cladding systems. 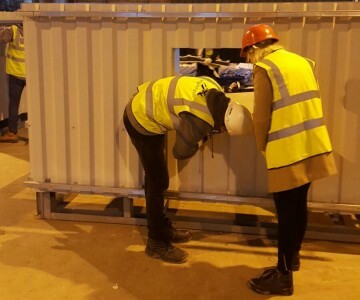 They began with learning the study of the steel structure, which involved examining typical frames and understanding the importance of the interaction between cladding and steelwork. Along with this they discussed the advantages and disadvantages of different cladding systems and components. Emmie said that “The building performance aspect of the course was brilliant” stating that it covered thermal information such as u-values, acoustics and fire performance. During the last 12 months, 14 of our team have successfully completed the training course, we are currently scheduling for 2016 dates. Autumn is a time for celebrations, with Halloween and Bonfire Night heralding the transition from Summer to Winter. This year it coincides with recognition of the ongoing evolution of our popular standing seam roof system Euroseam. The principles of Euroseam are well-established; a standing seam aluminium roof with no visible fixings which provides roofs with clean, attractive lines and can be rolled onsite to extremely long lengths, eliminating end laps. Euroseam roof systems were first awarded BBA certification in 2005 and updated in 2007. The 2015 update of the Certification reflects the consistent product development that we are committed to, providing systems that can react to the changing needs of our customers – including greater system range coverage and improved load/span capacity. 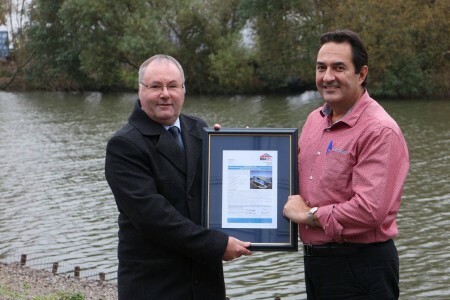 Pictured is Brett Wood of BBA, awarding the official BBA Certification to our Group Technical Manager Paul Clayton. Paul has managed BBA certification of all of Euroclad’s systems since 2004 when SF500 roof systems were the first to achieve coverage.